Using Chillies to Protect Maize Fields and Elephants | Stories | WWF. Pretty cool story about a simple way to deter elephants! Great to have people who care about the animals around them as well as themselves. WWF is assisting in this country’s production of chillies in the hope that it will help those in need by becoming a cash crop. 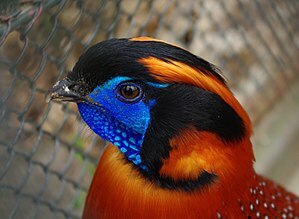 ARKive – Temminck’s tragopan videos, photos and facts – Tragopan temminckii. So yesterday, I noticed a post about the Glass Frog from facebook’s I F-ing Love Science (they post some fabulously interesting stuff). The 10 Weirdest and Most Unusual Frogs on Earth | Frogs Are Green. Food for thought: does the skin of the glass toad (probably already fragile like the absorptive skin of other amphibians) leave them even more susceptible to infection or parasitism? Surgery allows blind orangutan to see her babies – Yahoo! News. It’s been a little while since I posted. My b. I’ve been trying not to freak out over being back at one of my favorite places among some of my favorite people. My birthday was this wednesday and I got to spend part of it brushing up on PCR! I’ve found that I really enjoy it. That’s probably good since I see a large amount of it in my future. Despite the tedium of pipetting sample after sample into teeny tiny little tubes, you can get some pretty cool stuff out it. My favorite is loading the gels. I got the astounding compliment from the PhD student directing me that it was the best first load attempt she’d ever seen. I then went ahead, and had a poor second attempt (it did settle itself out). Too excited about compliments. My birthday was spent in as crazy a fashion as possible. It was a wednesday after all. No one was out really. But I did get to play bingo in a bar while wearing an epically cute dress…Round 2 of festivities start tomorrow! I am currently in the process of waiting on my “big girl” gel to run. My lovely PhD student had to run off to complete her TA duties and I was left with the knowledge from wednesday as well as my lab journal full of protocols. I tried to remember as many subtleties as possible and not screw up too badly, so we’ll see how that goes. She should be back in time to help me with the part I remember least which is the actual reading of the gel. The first week of class is done as well! I had none today, hence the PCR project. I have only 2 graded classes, 2 seminars, a journal club, a class to audit and random training obligations. From 9-5 I am either at one of those things or in the lab gettin muh science on. One of my classes, cross listed with a vet school course, doesn’t even start until late next month. It’s of course subject to a change in class time, so that should keep me on my toes. I’m, thankfully, getting acclimated to long days sitting in a chair waiting for things to run. There usually seems to be someone around to chat with when you’re bored to the point of propping your head up with objects found on your desk. Next task? Try to finish this horribly boring training full of more typos than my brain can handle. Coming Soon: Artificial Limbs Controlled by Thoughts: Scientific American. Rudimentary Liver Grown in the Lab: Scientific American.